Customers always seem to smile when they see my jewelry, so I suppose you could call my style modern, happy, and cheerful. I am inspired by color--colors in nature especially, and colors in paintings created by the old masters, especially Van Gogh, Monet, Manet, Cezanne and others. Glass!! I am a lampwork artist first, and a jewelry designer second. 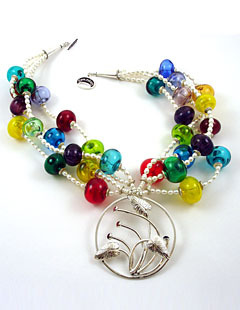 I enjoy combining other materials with my glass beads, such as gemstones, seed beads, pearls and sterling silver. Our local library was having a fundraiser, and my husband and I wanted to contribute a spectacular piece to the auction. We were inspired by some photos of Art Deco jewelry we had looked at recently. We did sketches of the necklace together--Jim planned the silver centerpiece, and I planned the glass beads and pearls. Our first finished design seemed a little too bold when I tried it on, so we modified it somewhat for the final necklace. It was a showpiece, however, so we created a shadow box frame for the piece. The winning bidder loved the necklace, and the fact that she could hang in on the wall when not wearing it. 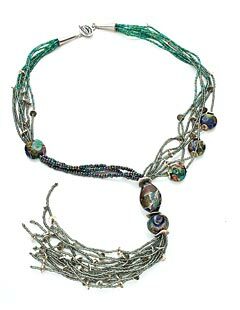 I began making bead jewelry more than 50 years ago. As a teenager I used charms, pop beads, and homemade paper beads for some of my early creations. My Grandmother and Mother both encouraged me. I remember poring through their costume jewelry, and using the broken bits and pieces they gave me to create necklaces for myself. Yes, I have a degree in Art Education. For a while I was a pen and ink artist, then dabbled in Watercolors, and moved on as a Fiber Artist for many years. 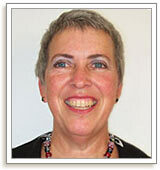 I met my husband, a metalsmith, in 1974, and we opened several retail stores together. From 1975 until 1990 we owned and operated a fine jewelry store. He did the custom design and manufacturing of most of the rings and other jewelry, while I designed necklaces and bracelets using gemstones, antique beads and other materials. I'm not sure how I discovered Fire Mountain Gems. When we owned our retail stores we purchased from FMG. Then I began buying supplies from you again for the second part of my jewelry career in 2001. The International Society of Glass Beadmakers. And online, Art Bead Scene, Lampwork, Etc. I continue to paint with watercolors, draw with pen and ink, and recently started a series of mixed media pieces. I also crochet. And when I have time, I enjoy reading. I am writing a book about 12 years that we spent sailing around the world on our own sailboat. Jewelry-making plays a central role in my life. My husband and I, both artists, became partners in the jewelry business even before we married. We continue that partnership today, some 36 years later. Jewelry has been a full-time career for us, and we love it. Since we are both over 60 years old, we have slowed down a bit, however, not much. My husband continues to make a line of silver jewelry on his own, I make a line of glass bead jewelry on my own, and together we combine our talents to produce jewelry of my glass and his silver. I support several local charities. We believe in donating to causes that we know something about, so we give to our local library fundraiser twice a year, a local music school, a local charitable women's league, and a local Art Guild. I am fortunate to be known in the area, and my jewelry brings high prices at auctions for these causes, raising far more than I could give in dollars. It is a win-win situation. I also recently donated a piece to ACT (Artists Changing Tomorrow), a Texas foundation that provides art education to school children. Make what you love, what speaks to you. The love will be evident in your work, and the sales will follow, even when you least expect them. View all of Lyn's designs in the Gallery of Designs. Lyn Foley loves making glass beads. She likes to see people smile when they discover her artwork or light up when wearing something she's created. A quote from ballet dancer Mikhail Baryshnikov sums up her motivation: "The essence of all art is to have pleasure in giving pleasure."